Prior to completing our look at the MacBook Air, we asked readers to contribute questions and concerns about the new model in "What's wrong with the MacBook Air?" The response was overwhelming, and helps underscore the fact that the Air has captured the attention of customers both with its new form factor and with its controversial design tradeoffs engineered to deliver its thin profile and light weight. Every product involves a series of engineering decisions. The Air trades off some high end features of the MacBook Pro to slim down in size and weight, and trades off the economy of the MacBook in order to deliver a desirable punch that matches its razor thin outline. In our review, we'll look at three major categories of Apple's engineering decisions that resulted in the Air: mobility, performance, and overall design. Mobility looks at how the Air competes in terms of small physical size versus practical usability. Performance examines its top speed capacity versus heat generation, fan noise, and battery life. Design compares its offerings in rich features versus a delivery of pared down, elegant simplicity. Each area considers a balance between two extremes in desirable aspects. Every competing ultra mobile laptop alternative to the MacBook Air makes different design decisions that renders it more or less suitable for specific types of tasks. Apple's first foray into the modern market for ultra mobile laptops takes a unique turn compared to other models in its class, as detailed in How the MacBook Air stacks up against other ultra-light notebooks. Most existing ultra mobile units are built around smaller displays and reduced size keyboards. For example, the Asus EEE PC and the OQO e2 can fit in a large pocket, but have 7" and 5" screens respectively. More conventional light laptops such as the Sony TZ line achieve their mobility using an 11.1" screen. Smaller screen sizes allow a reduced overall footprint but also demand a smaller keyboard. Alternatively, mobile laptops that provide a standard sized keyboard and full sized display commonly come in a package similar to the existing MacBooks. The highly rated Lenovo ThinkPad X61 has a full sized keyboard, but makes room for it by omitting a trackpad. It's also well over an inch thick and 20% heavier. Other laptops that provide a full sized keyboard similarly do so using a full sized case. After all, why be light and thin without a small outline, and why be full featured in the keyboard and screen without being full sized? Apple provides a unique answer in the Air. 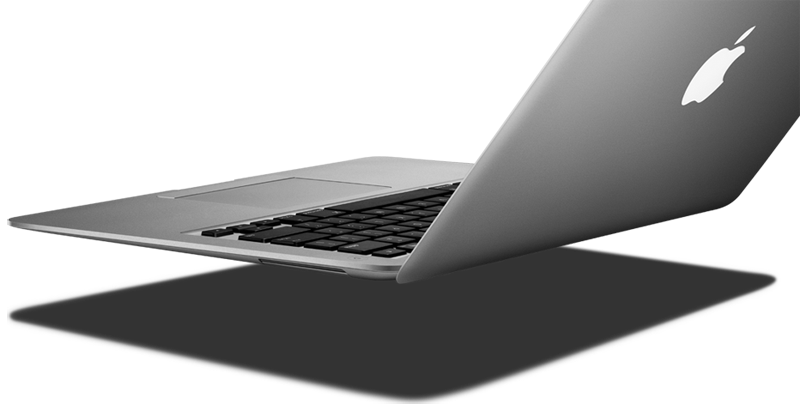 For the MacBook Air, it appears Apple started with a full sized keyboard and selected a matching display. The inch of margin around the keyboard makes the Air the same width as the MacBook, and similarly gives it room for the same sized display. However, the Air uses that margin to quickly taper down into a whisper thin edge, giving the Air a much slimmer profile. Physics simply limits the degree to which the Air could be reduced in size using the same design proportions. Were it to attempt to cram the same full sized keyboard into a smaller outline, it would have to use a smaller 11" display but would also quickly lose internal volume unless it reduced the thin taper on the edges. Less internal room would mean it would either need to have a much smaller battery and compromise its logic board and disk allocation further, or revert to the boxier shape of conventional laptops. That's exactly what the 12" PowerBook did; it used a slightly smaller keyboard and display, but ended up considerably thicker than the 15" and 17" models it was sold next to. In terms of mobility, Apple balanced a full sized keyboard and display and an exceptionally thin case to deliver the Air as a light, slim alternative to other MacBooks rather than simply a scaled down mini version. The Air isn't supposed to be a curiosity of miniaturization, but a full sized, practical laptop that is easier to carry around and sexier to show off. The latest MacBook weighs five pounds, and the new 15" MacBook Pro is 5.4 pounds. The Air is just 3 pounds. It's not only much lighter than its siblings, but its tapering frame makes it feel even lighter and more compact than it is. Closed, the unit looks and feels tiny, but once opened it feels luxuriously large. Its tapering aluminum edges also give the unit a rugged, solid feel. Gripping the unit on both sides of the keyboard, there is simply no flex at all. It feels like a solid cast chunk of aluminum, without the expected weight. The lid is so thin that it can be flexed, but feels far more durable and substantial than the thicker display of the MacBook Pro. The Air's new hinge design also feels solid and smooth, with no play or bounce. When shut, the unit feels like an armored tank, with no fragile exposed ports, switches, or latches. The flip down port cover that hides the USB, video, and headphone jacks also feels durable and solid. The tapered edges that make it feel so thin also contribute toward this rigidly substantial feel. Of course, you're not going to want to use the Air as a frisbee or stand on it, but as a mobile laptop it appears to have the durability to well withstand the common hazards of traveling. The slimmer power adapter with an angled MagSafe connector is also a mobility feature, particularly when compared to the huge, heavy and clumsy brick required by the MacBook Pro. The right angled MagSafe cable should also relieve the cable stress that wears at the junction of the wire and the power connector of Apple's existing MagSafe plugs. The Air's mobility certainly has some drawbacks too, highlighted in the design section below. Overall however, it looks like Apple delivered serious usability in a very compact and well built shell. Is there room to get smaller with the Air? Right now, Apple appears content to ignore the tiny gadget computer market. Shortly after delivering the Titanium PowerBook, a group of Apple engineers put together an ultra compact version that the company refused to bring to market. That conflict resulted in some of those employees leaving to form OQO. While that company has gone on to produce some extremely small computers, their practical applications are limited. Until that segment ever takes off, the MacBook Air will likely remain Apple's target for delivering a light and thin notebook. Underneath the Air in size and price, Apple is developing its iPhone and iPod Touch as a "WiFi mobile platform" to absorb the needs of active mobile users who want to access their information and to browse the web in a format dramatically smaller than a laptop product can deliver, as noted in the article The Unrealized Potential of Apples Hybrid Platform: Mac, iPod, iPhone, and Apple TV. This further makes it unlikely that the company will work to scale the Air down into the sizes pioneered by OQO. Of course, if the Air is a hit Apple might consider introducing a scaled down version that makes even more compromises. For now, the Air has already stirred up a whirlwind of controversy regarding the tradeoffs required to deliver its debut size, shape, and weight. On page 2 of 5: Air Performance: CPU and Graphics; Memory and Disk; The Performance Numbers; and Performance Efficiency.